Following a two year absence, Auckland is once again hosting a high quality men’s Professional golf tournament with the announcement of the 2018 New Zealand Masters to be held at Wainui Golf Club from 11-14 January. The New Zealand Masters will be the first event of the season on the ISPS HANDA PGA Tour of Australasia and provides an excellent opportunity for Professionals to kick start their year on one of New Zealand’s most testing layouts. Following in the footsteps of New Zealand’s premiere event – the ISPS HANDA New Zealand Open, the New Zealand Masters will see amateurs joining the Professionals, albeit under a new, slightly different and exciting format. 50 amateurs will join the remaining 50 professionals following the traditional second round cut. The Professionals will continue to compete for the New Zealand Masters title, as well as engage in a separate team competition with their amateur partner. This will provide a unique opportunity for amateurs to compete alongside professionals as well as see the culmination of a significant tournament right from inside the ropes. With talent such as Ryan Fox and Michael Hendry expressing serious interest in the tournament, those lucky to enough to secure a spot in the field could be playing alongside world class, proven performers. Both Fox and Hendry are currently ranked within the top 140 players in the world and have both competed in Major Championships during their 2017 campaigns. The tournament is the brainchild of two diehard golfing fans and well-known Auckland businessmen, Gerard Peterson and Rod Duke. Longtime supporters of many New Zealand golf professionals, they saw an opening for this type of tournament in Auckland. 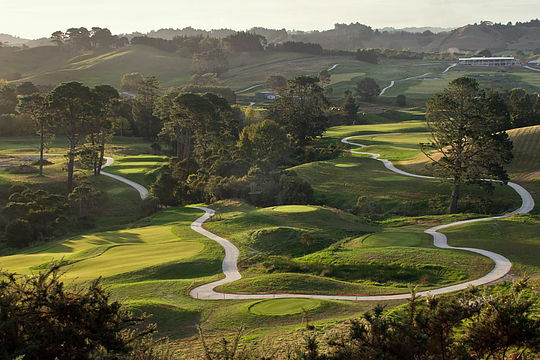 “We were keen to showcase what a phenomenal course Wainui is and at the same time get an Australasian professional men’s golf tournament back into Auckland,” said Rod Duke. Located on the North Shore and a brief 25-minute drive from the Auckland CBD, Wainui has been open just over 12 months, but already has gained a reputation as a championship course with world class facilities. “The course is now fully bedded down and will be in absolute pristine condition come January, it is going to be a stern test of golf from our back tees which I know the pros are going to enjoy,” said General Manager Terry Yacyshen. The tournament will tee off the 2018 ISPS HANDA PGA Tour of Australasia season and will carry a AU$100,000 prize purse as well as Official World Golf Ranking points and the Black Jacket.